The tutorial explains the essence of Excel logical functions AND, OR, XOR and NOT and provides formula examples that demonstrate their common and inventive uses. Last week we tapped into the insight of Excel logical operators that are used to compare data in different cells. Today, you will see how to extend the use of logical operators and construct more elaborate tests to perform more complex calculations. Excel logical functions such as AND, OR, XOR and NOT will help you in doing this. Microsoft Excel provides 4 logical functions to work with the logical values. The functions are AND, OR, XOR and NOT. You use these functions when you want to carry out more than one comparison in your formula or test multiple conditions instead of just one. As well as logical operators, Excel logical functions return either TRUE or FALSE when their arguments are evaluated. The following table provides a short summary of what each logical function does to help you choose the right formula for a specific task. AND Returns TRUE if all of the arguments evaluate to TRUE. =AND(A2>=10, B2<5) The formula returns TRUE if a value in cell A2 is greater than or equal to 10, and a value in B2 is less than 5, FALSE otherwise. OR Returns TRUE if any argument evaluates to TRUE. =OR(A2>=10, B2<5) The formula returns TRUE if A2 is greater than or equal to 10 or B2 is less than 5, or both conditions are met. If neither of the conditions it met, the formula returns FALSE. XOR Returns a logical Exclusive Or of all arguments. =XOR(A2>=10, B2<5) The formula returns TRUE if either A2 is greater than or equal to 10 or B2 is less than 5. If neither of the conditions is met or both conditions are met, the formula returns FALSE. NOT Returns the reversed logical value of its argument. I.e. If the argument is FALSE, then TRUE is returned and vice versa. =NOT(A2>=10) The formula returns FALSE if a value in cell A1 is greater than or equal to 10; TRUE otherwise. In additions to the four logical functions outlined above, Microsoft Excel provides 3 conditional functions - IF, IFERROR and IFNA. In arguments of the logical functions, you can use cell references, numeric and text values, Boolean values, comparison operators, and other Excel functions. However, all arguments must evaluate to the Boolean values of TRUE or FALSE, or references or arrays containing logical values. If an argument of a logical function contains any empty cells, such values are ignored. If all of the arguments are empty cells, the formula returns #VALUE! error. If an argument of a logical function contains numbers, then zero evaluates to FALSE, and all other numbers including negative numbers evaluate to TRUE. For example, if cells A1:A5 contain numbers, the formula =AND(A1:A5) will return TRUE if none of the cells contains 0, FALSE otherwise. A logical function returns the #VALUE! error if none of the arguments evaluate to logical values. A logical function returns the #NAME? error if you've misspell the function's name or attempted to use the function in an earlier Excel version that does not support it. For example, the XOR function can be used in Excel 2016 and 2013 only. 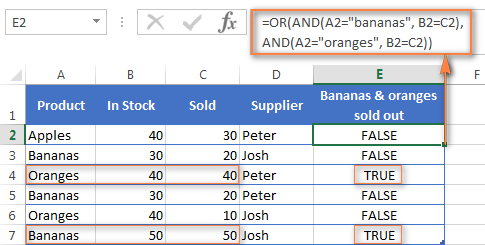 In Excel 2016, 2013, 2010 and 2007, you can include up to 255 arguments in a logical function, provided that the total length of the formula does not exceed 8,192 characters. In Excel 2003 and lower, you can supply up to 30 arguments and the total length of your formula shall not exceed 1,024 characters. The AND function is the most popular member of the logic functions family. It comes in handy when you have to test several conditions and make sure that all of them are met. Technically, the AND function tests the conditions you specify and returns TRUE if all of the conditions evaluate to TRUE, FALSE otherwise. Where logical is the condition you want to test that can evaluate to either TRUE or FALSE. The first condition (logical1) is required, subsequent conditions are optional. And now, let's look at some formula examples that demonstrate how to use the AND functions in Excel formulas. =AND(A2="Bananas", B2>C2) Returns TRUE if A2 contains "Bananas" and B2 is greater than C2, FALSE otherwise. =AND(B2>20, B2=C2) Returns TRUE if B2 is greater than 20 and B2 is equal to C2, FALSE otherwise. =AND(A2="Bananas", B2>=30, B2>C2) Returns TRUE if A2 contains "Bananas", B2 is greater than or equal to 30 and B2 is greater than C2, FALSE otherwise. By itself, the Excel AND function is not very exciting and has narrow usefulness. But in combination with other Excel functions, AND can significantly extend the capabilities of your worksheets. For more IF / AND formula examples, please check out his tutorial: Excel IF function with multiple AND conditions. 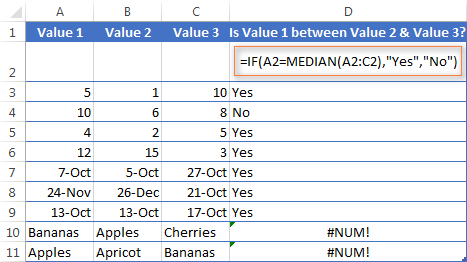 If you need to create a between formula in Excel that picks all values between the given two values, a common approach is to use the IF function with AND in the logical test. 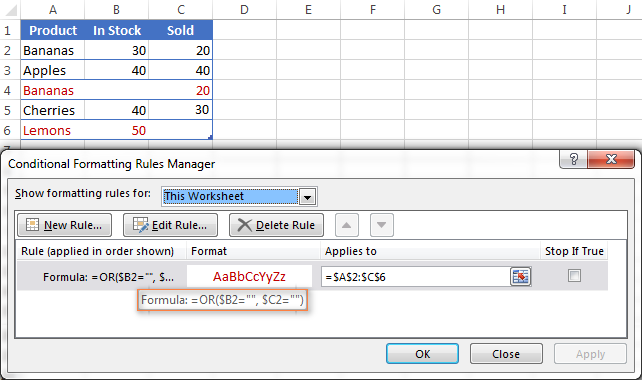 As demonstrated in the screenshot above, the formula works perfectly for all data types - numbers, dates and text values. When comparing text values, the formula checks them character-by-character in the alphabetic order. For example, it states that Apples in not between Apricot and Bananas because the second "p" in Apples comes before "r" in Apricot. Please see Using Excel comparison operators with text values for more details. As you see, the IF /AND formula is simple, fast and almost universal. I say "almost" because it does not cover one scenario. 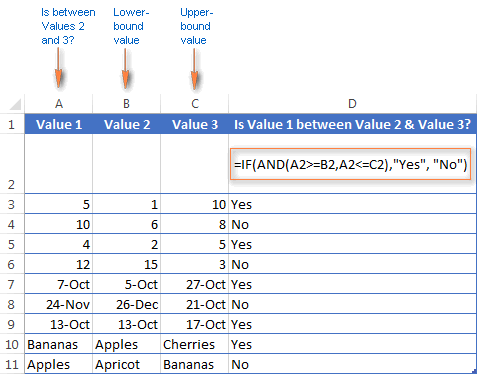 The above formula implies that a value in column B is smaller than in column C, i.e. column B always contains the lower bound value and C - the upper bound value. This is the reason why the formula returns "No" for row 6, where A6 has 12, B6 - 15 and C6 - 3 as well as for row 8 where A8 is 24-Nov, B8 is 26-Dec and C8 is 21-Oct. But what if you want your between formula to work correctly regardless of where the lower-bound and upper-bound values reside? In this case, use the Excel MEDIAN function that returns the median of the given numbers (i.e. the number in the middle of a set of numbers). As well as AND, the Excel OR function is a basic logical function that is used to compare two values or statements. The difference is that the OR function returns TRUE if at least one if the arguments evaluates to TRUE, and returns FALSE if all arguments are FALSE. The OR function is available in all versions of Excel 2016 - 2000. Where logical is something you want to test that can be either TRUE or FALSE. The first logical is required, additional conditions (up to 255 in modern Excel versions) are optional. And now, let's write down a few formulas for you to get a feel how the OR function in Excel works. =OR(A2="Bananas", A2="Oranges") Returns TRUE if A2 contains "Bananas" or "Oranges", FALSE otherwise. =OR(B2>=40, C2>=20) Returns TRUE if B2 is greater than or equal to 40 or C2 is greater than or equal to 20, FALSE otherwise. =OR(B2=" ", C2="") Returns TRUE if either B2 or C2 is blank or both, FALSE otherwise. The formula returns "Good" if a number in cell B3 is greater than 30 or the number in C2 is greater than 20, "Bad" otherwise. The rule with the above OR formula highlights rows that contain an empty cell either in column B or C, or in both. In Excel 2013, Microsoft introduced the XOR function, which is a logical Exclusive OR function. This term is definitely familiar to those of you who have some knowledge of any programming language or computer science in general. For those who don't, the concept of 'Exclusive Or' may be a bit difficult to grasp at first, but hopefully the below explanation illustrated with formula examples will help. The first logical statement (Logical 1) is required, additional logical values are optional. You can test up to 254 conditions in one formula, and these can be logical values, arrays, or references that evaluate to either TRUE or FALSE. TRUE if either argument evaluates to TRUE. FALSE if both arguments are TRUE or neither is TRUE. =XOR(1>0, 2<1) TRUE Returns TRUE because the 1st argument is TRUE and the 2nd argument is FALSE. =XOR(1<0, 2<1) FALSE Returns FALSE because both arguments are FALSE. =XOR(1>0, 2>1) FALSE Returns FALSE because both arguments are TRUE. FALSE if is the total number of TRUE statements is even, or if all statements are FALSE. Contestants who won Game 1 and Game 2 advance to the next round automatically and don't have to play Game 3. Contestants who lost both first games are knocked out and don't play Game 3 either. Contestants who won either Game 1 or Game 2 shall play Game 3 to determine who goes into the next round and who doesn't. As usual, in Microsoft Excel there is more than one way to do something, and you can achieve the same result by using the Not equal to operator: =C2<>"black". Another common use of the NOT function in Excel is to reverse the behavior of some other function. For instance, you can combine NOT and ISBLANK functions to create the ISNOTBLANK formula that Microsoft Excel lacks. Translated into plain English, the formula tells Excel to do the following. If the cell C2 is not empty, multiply the number in C2 by 0.15, which gives the 15% bonus to each salesman who has made any extra sales. If C2 is blank, the text "No bonus :(" appears. In essence, this is how you use the logical functions in Excel. Of course, these examples have only scratched the surface of AND, OR, XOR and NOT capabilities. Knowing the basics, you can now extend your knowledge by tackling your real tasks and writing smart elaborate formulas for your worksheets. 404 Responses to "Using logical functions in Excel: AND, OR, XOR and NOT"
If x is less than or equal to 1600 them yes or if x is not available then "not avl"
i need a formula for. . I hope this helps. Please let me know if you have any other questions or difficulties. can you help me in macro how to record macro ? First you have to save as your Excel sheet to .xlsm. after this step you have to go view ribbon and choose Macro option. There you can find macro recording. Start recording and work in the same sheet without using mouse, it works perfectly. Because if you use mouse Macro may not write program as per your clicks. Once you stop recording you just give an non-calculated report which you did earlier and run macro from same macro option. I need to make a formula to count 3 different columns but counting just one time if they have more than one value for the others 2 columns. I try different ways but I don't know do it! It returns a 0 in all cells, even if a 1 occurs. Can you help at all? It looks to me like you have a space after all your 1's that are in your speech marks. If the cells on the other spreadsheets just contain a "1" and not a "1 " then the formula won't recognise the 1 because it will be looking for a 1 and a space. I AM USING THIS FORMULA BUT THE RESULT IS " #VALUE! " 1) To make this easier, separate the formulas and evaluate each one separately. I noticed that there is overlapping logic. If formula #1 is False you get a -0- and if formula #3 is True you get a -0-, and the same thing with 127 and 112 across all 3 formulas. How would you know which values gave you the answer? Also, what if the input values do not match your expected answers, do you evaluate them? And your attempt to nest the IF statements is wrong. Nesting as below will work but you will still only get 112, 127 or -0-. If Mr.A has 125 coins then he will get "1 Apple" and if Mr.A has 170 coins then he will get "1 Apple" for 125 coins and on balance 45 coins, he will get "1 Lemon" on every 25 coins. Please convert the same in to logical formula in excel. Hello, I need help. I need to verify whether my column C's (numeric) information and column B's (description) information are appropriate and accurate for my column A's (code). Thanks in advance. 1. How many have neither registered nor completed any of the 3 courses? 2. How many have registered or trained in atleast 2 of the 3 courses? 3. How many have not been trained in any of the 3 yet? Wanted to extend my thanks. This is exactly what I was looking for! hell can you help me. i sen message to facebook and come friend. I need a formula to calculate a variable sales commision. if I sell 8 or less, I get $x. if I sell 9-15 units, ill get $y. with a variability of 5 different pay rates for commission. Hi, i need a formula to calculate a range table of age like 15-34, 35-44, 45-49 and they have to match with 2 different class, with 2 different amounts link to each class, if the amount in column A is <=34 and column B is "2" the amount should be the amount in cell G2 or if Column B is "1" it should be the amount in cell G3. hope you can assist. i'm working on a daily tracker which is updated on a daily basis value "0" or more than 0 . like 1 or 2. in left to right order. i want something which should indicate me if last 3 days value is "0". Guy's please help to fixed the formula in below condition. I have applied formula =(IF(O2<10,"<10",IF(O2<20,"10-20 Min",IF(O2<30,"20-30 Min",IF(O2<60,"30-60 Min",IF(O2=120,">120 Min"," "))))))) but result is not proper. I want formula for date. I have to find month of increment from his joining date. Such as if date of joining is up to 15th the date of increment will be same month and if date of joining is after 15 then date of increment will be next month. Example, Date of joining of any employee is 12/03/2017 then increment month will be March, whereas date of joining is 16/03/2017 then increment month will be April. I want formula for date. I have to find out the month of increment from joining date of an employee on excel sheet. Such as if date of joining is up to 15th the date of increment will be same month and if date of joining is after 15th then date of increment will be next month. If the following cell (g2) contains any of these: early 5, mid 5, late 5 and the other cell (h2) has a value >=38 then I need cell (I2) to say "YES" but if cell (h2) has a value<=12 then I need cell (I2) to say "NO" otherwise cell (I2) needs to say "NA"
A >8000 Irs, B <8000 Irs and C as <1000 Irs. If Cell A1 contains DELETE then return nothing, else return Cell contents of A1 to C1. And another formula: If Cell C1 contains nothing, do nothing. Else return contents of Cell B1 to D1. Basically, if this example uses a period to indicate a new cell it should look like this. PLS I NEED YOUR HELP, BEEN THINKING ABOUT THIS IN THE PAST 2 MONTHS BUT UNTIL NOW I DONT HAVE ANY SOLUTION TO THINK OF. RIGHT NOW IM USING 2 WORKBOOKS TO WORK ON THIS. BUT I WANT TO USE ONLY ONW WORKBOOK . THIS WORKBOOK HAS TO BE USE EVERY YEAR WITHOUT CHANGING THE EXCHANGE RATE OF 2017 TO 2018. IF YOU WANTED TO KNOW MORE ABOUT MY WORKBOOK I CAN EMAIL YOU THE TEMPLATE. How do I use an AND function To return a value other than True or False,For example: If cell A2 is greater than 20 and B2 is greater than 10 it should return Pass not true. How can I do that? I have already create this sheet ,but I'm creating my own sheet specific total amount. I need to nest the following formula so that it goes horizontally across my spreadsheet. I either get FALSE or #VALUE. The numerical value in row 4 is a score dependent on the result content of row 6. Just using the formula below I get the answer 5 which is correct but I need to nest 19 columns worth! I Have Used This Formula In excel Sheet, But In This If The Valuve Is Less Then 4000, So Then Then the Folmula Value Show Is "0"
Can U Guide What The Formula. How to make a formula for time and minute for example i have to make a table for my employer when they came to work and when they finish work.cell A 7:30 and cell B 15:30 how much time they work. In Cell A1 I simply have the number 1. In cell B1 I need an if statement that returns the letter D if A1 is less than 5, C if less than 10, B if less than 15 and A if less than 20. Good job you are doing. Create a whats app group for Excel where we can ask any Questions and reply to all that will be great. Your question is unclear, but I'm thinking you should somehow separate the data by year and then apply the interest. Otherwise, how will Excel know what year it is? Hello, can I ask for help? I have to count how many times each person went to some places in a certain range of date from different sheet. I have tried use 'COUNTIFS' but I got '0' for the result. Can you tell me problem that might happen in this case? The data is in 2 columns A and B. IF "A1">TODAY DATE AND EQUAL TO DATE (2018,10,1) THEN "YES" AND IF "A1">TODAY DATE AND > DATE(2018,10,1) THEN "NO" AND IF "A1" < TODAY DATE THEN "EXPIRE". Is there some form of if statement that has more than 2 logical parts. For instance, instead of outputting TRUE or FAlSE, or the equivalent. IT could output any number of different responses. There are several techniques that work the way you're asking about. Their use depends on the required logic of the situation. Then there are COUNTIF, SUMIF, IFS and others most of which are explained here in the various ABLEBITS articles. Just enter one of the above titles in the Search box and begin to learn about IF statements. I sell a product that has different names ( up to 700) is there a formula that I can use that can count how many times I have sold a product with one name by comparing the sales data against the list of names ? Enter SUMPRODUCT in the search field here on AbleBits. I think you'll find the answer to your question. I need a forumla/macro for the following argument. The results should be returned in cell C1 by way of a changed cell colour only. There are a bunch of arguments applied to each cell based on the values given in cells A1 and B1. I'm assuming I'm going to need a macro for this? Before you look over my solution, let me say to you and anyone else seeing it that I know this formula contains about 20 too many IF/AND statements. It should be in a VLOOKUP, INDEX/MATCH or ideally in VBA code. However, the VLOOKUP and INDEX/MATCH solutions are more difficult for me to explain and the VBA is outside the scope of this blog. So, with that said I will caution you that something like this could be very difficult for anyone coming after you to follow and if you need to modify it, will be a pain. Anyway, these were the conditions you outlined so here it is. This will put the color's words in the C cells because I needed something easy to follow during the testing. Also, you can now conditionally format the column using a IF cell text is "Amber" or whatever approach to format the cell's color. Otherwise, the Conditional Formatting formula would be a mess. As I say, I know there are other ways to accomplish this, but at the end of the day, I think this is the easiest, in this forum. The logic in your statement needs to be clearer. It should read like "If K70 is greater than or equal to 30 then A, etc. What is "A", "B" and or "C". Values held in other cells? Partial cell addresses? The second condition needs to be clarified. Is this an AND or an OR relation to the first statement? After Excel checks these conditions what is it supposed to do? What if none of the conditions are true? if there is a value >= to 33 is "A"
then if there is a value between 28-32 is "B"
I'm looking for the correct and/or statement. When it was just AND statement, it worked. Now that I need to incorporate OR, it's not working. Need to turn it into something that will give me the following responses. Pretty much A46 will either be Pending, Awarded or Closed. Text and numbers don't mix very well in Excel formulas, so make sure your numbers are actually formatted as numbers. If have to add the print the the value in C1. any body please help to write formula for that. If you can simply put a "0" in A or B when student is absent then the formula is very simple. In C1 just enter =A1+B1. If A1 and B1 both hold "A" the IFERROR returns the message, "Student Was Absent for Both Subjects". You can change the cell addresses and the message to suit your needs. Hello, I need some help with formula related to day of the week. If day = Tuesday or Thursday, a formula needs to be incremented by 1. I can get it to return True if the day is Tuesday or Thursday and have that in a column. I tried the formula below but it increments by 1 no matter what h3 is. I also tried this but it also increments by 1 no matter what h3 is. This might be one of the best excel tutorials I've ever read! Very well written, and the examples really help show how the functions work. I need help with an "IF" "AND" formula. i want to have logical comparision or any suitable formula for folowing condition pls guide. 2Inch,column 4 value is -40 schedule,column 5 value(heat no) will be "abcd"
also in same formula column 4 may varry like it may40,80,160 many numbers then my column 5 will be identified value to add in column 5.i.efor 40 sch colm5 value is abcd if column 4 value is 80 then column5 value is efgh,if column 4 value is 160 then column5 value is ijkl. For testing some lower percentages requires logic test result in the list. I was able to achieve and find the conversion of the date format to a number with "=LEFT(MONTH(D13),2)"
The blank cells are coming up with "Jan" where it should be a blank "" as in the formula above. Used the LEFT(MONTH(CELL_REF),2) to verify the translation of the date to number, THEN expanded it to the following, it worked. Alright! That's a lot of nested IF's but you figured it out. Congratulations on a good use of the MONTH function. Thank you for sharing. I'm sure others will benefit from your work. You have eliminated my sleepless night for weeks now. I have A2=28, B2=45 to get a smaller value i applied the formula =IF(A2>B2,A2-B2,A2). So i got an answer has 28. My question is if i change a value in A2=50 now i should get a value has B2 in C2 cell. Still it is not working, can someone assist me how to put a formula with a proper condition? You can learn more about Excel Nested IF in Excel in this article on our blog. Hi, I need to calculate the tax for the incomes. If the income is 5000 that is tax free. If the income is greater than 5000 and less than 12500 then, it is 12500-5000 and the remaining is taxed 2% and if the income is more than 12500 and less than 100000 then first 5000 is deducted then 12500 is deducted to be taxed 2% and then the remaining is taxed 10% and if the income is more than 100000 then the 87500 is to be taxed at 10% and then the remaining is taxed 20%. Is it possible to bring them in only one function? Thanks for your kind support. I've been trying to figure this out for two days using various resources and I'm stuck. I feel like the solution is easy and I'm just overthinking it at this point. Let's say I have a table in Excel with headers and many rows of varying text and numbers, with some cells containing both (random ID numbers generated by an outside source). The table and headers have names for use in other formulas (no trouble there). I hope this makes sense, and I appreciate any ideas anyone may have. Thank you! I have 2 worksheets containing an identical layout - one is data ran last week called ‘old”containing 6000 rows of customer data and then data ran this week ‘new’ containing 7000 rows of data. Both have one header row. I need to find any changes occurred on each customer record - column A contains a unique ID for each customer and column P is the data range I need to look for changes in). NB; the data will be held on different numbered rows . 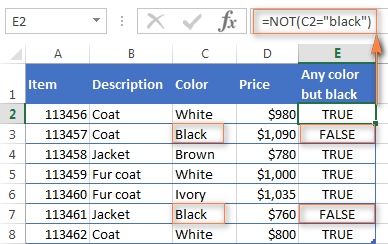 So to match and highlight unique id’s/customers from column A on the old sheet to column A on the new sheet ( I can do this by using conditional formatting =COUNTIF(old!$A;$A,A2)=1 with a range of $A$:$A$9999. Then I format fill in green to highlight but then of these matched green cases I need to look in column P for any changes to compare old and new values and it’s this part of the formula I need help with.... thanks in advance for any help anyone can offer. I have an excel sheet with many statements giving results as "True" or "False"
1) Now I need to introduce another column which will say if Cell A1, Cell A2, Cell A3 and Cell A4 are "True" say "Yes" if not say "No"
2) I also need another formula which says if Cell A1 and Cell A4 are "True" and Cell A2 or Cell A3 are "True" say "Yes" if not say "No"
Hi, i want to know the formula in Excel if i need to identify the negative figures and make it zero automatically then what is the formula. if enter roll name or name then all sub marks dispaly is it possible using vlookup?? I have tried this one but dosent work. please help how to coding in Ms Excel for the give table in ONE cell.